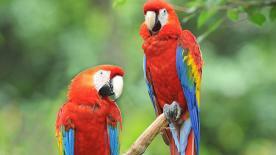 If there is a family of birds that are representative of Central America it is the Motmots. 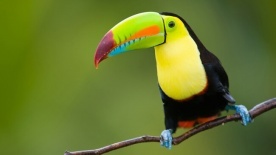 This vibrant, beautiful bird originated here in Central America and radiated south. There are 9 different species of Motmots, in Central and South America and 6 are represented in Costa Rica. 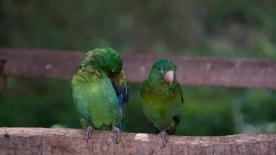 The two most common in Costa Rica are the turquoise browed and the blue crowned. The blue crowned are the easiest to see. The Rufus Motmot is very shy and is hard to spot. It spends it’s time in the Caribbean Rain forest. Two of the most difficult birds to see, and two of the most wanted for bird watchers are the tiny Tody Motmot and the elusive keel-billed Motmot. The most interesting feature of the Motmots are their racket shaped tails. It remains a mystery how they ended up with this unique feather design. Adult Motmots display two long slim tail feathers, so thin, they look like long skinny bones. At the end of each feather is a large round colorful circle of feathers. The Motmots like to nest in holes they dig on the sides of riverbanks, and roadsides. Images of the Motmot appear throughout archeological artifacts from Central America. 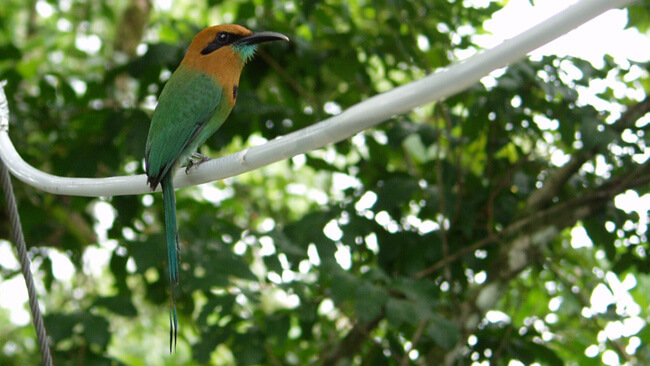 Legend says the Mayans named the ancient city of Copan, in Honduras after the Motmot. The Bribri Indians in Costa Rica have one of the nicest fables about how Motmots came to have racket shaped tails. The story tells that when God Sibu (the King Vulture) was creating the world, he asked for help from all the birds to finish the job. The lazy Motmot dug a hole to hide and avoid the work ahead. The Motmot unknowingly left his long tail feathers sticking out of the dirt. When the rest of the birds, working hard, saw the long lush tail feathers, sticking out, they became very angry at the lazy Motmot. Each bird, in turn, plucked one feather from the tail of the Motmot, leaving him with just the round paddles at the end of his tail.